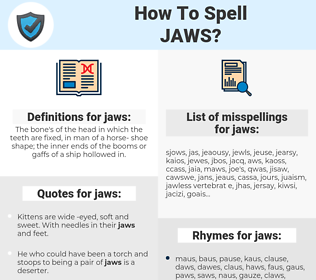 What are the misspellings for jaws? What are the common mistypes for jaws? What is the definition of jaws? What does the abbreviation jaws mean? What are the quotes for jaws? What are the rhymes for jaws? What are the translations for jaws? 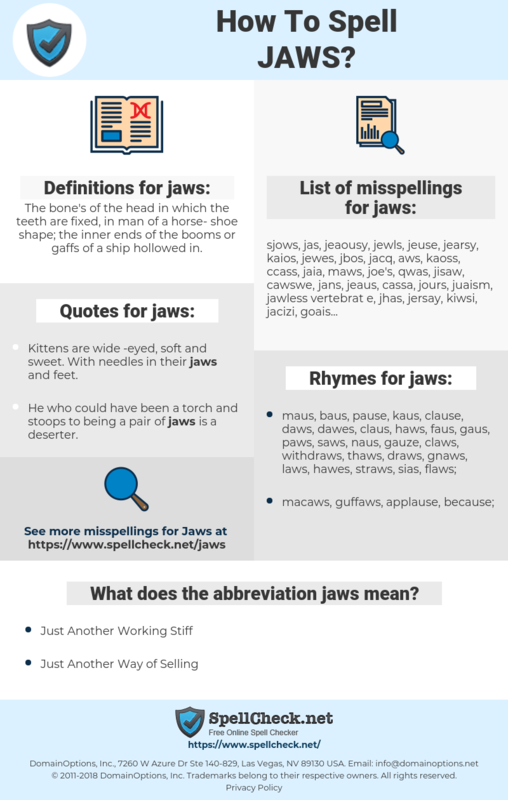 What are the common typos for jaws? The bone's of the head in which the teeth are fixed, in man of a horse-shoe shape; the inner ends of the booms or gaffs of a ship hollowed in. This graph shows how "jaws" have occurred between 1800 and 2008 in a corpus of English books. Kittens are wide -eyed, soft and sweet. With needles in their jaws and feet. We were equals once when we lay new -born babes on our nurse's knees. We will be equal again when they tie up our jaws for the last sleep. Kiefer, Kieferknochen, Maul, Rachen, Spannbacken, Klemmbacken, Mäuler, Fänge, Kinnladen, Fangmäuler. mordaza, mandíbulas, maxilares, mordazas, fauces, bocas, quijadas.